Google Code has highlighted many developers who've created applications using AppEngine, OpenSocial, AdSense, and Google Maps, however, we often forget to reflect on the stories of the people behind the code. In a series of upcoming blog posts we're calling Google Narratives, we'll be telling these stories to allow our developer community to interact and inspire each other to create or even improve existing projects. At last year's Google I/O, we met Dan Shahin of Hijinx Comics, whose creativity in using open source projects to build his business really makes him stand out. Dan agreed to chat with us and share his story. Thanks, Dan! The story of Dan and how he came to own a comic book store. 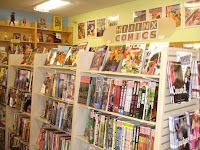 At 28 years running, Hijinx Comics, is the oldest comic book store in San Jose, California. From both a personal and business perspective, Hijinx Comics holds a special place in Dan Shahin's life. At the early age of 11, Dan was hired at Hijinx, which was at the same location at the time but went by a different name. Dan continued to work there throughout high school, building his lifelong passion for comics. He left the comic store behind to attend college and later worked at a number of high tech jobs, gaining experience in UNIX systems administration, release management, and software engineering. But by the year 2000, still Dan couldn't shake the feeling that something was missing in his life. Hours of soul-searching revealed that the missing piece was the excitement and passion that he had once experienced when working with comics. Dan decided to get in touch with the owner of the comic book store. It turned out to be perfect timing because the owner of the store was ready to sell. Dan picked up everything he owned and moved back to his old neighborhood to run the comic book store. 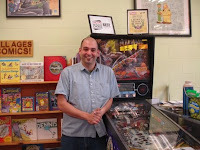 He reopened the store as Hijinx Comics and expanded on the traditional business of collectible comics and novelty items with a new focus on graphic novels and books focused on entertainment reading. Because of the amount of time Dan had worked with comics as a teenager, he had keen awareness of the pain points related to subscriptions and inventory. Drawing on these experiences, he developed a software suite to manage the subscriptions and inventory of his shop and of a brand new online bookstore. Best of all, he opensourced the whole offering to help other comic book stores alleviate the same issues. From there, a side business grew that involved him consulting and implementing a management system and hosting solution to other comic book stores across the nation. Today, Dan's working on Ver.2 of his project while Ver.1 runs his current business needs. Below are some excerpts from our meeting with Dan. Q: Tell me about your Google implementation and if there were any obstacles. Q: What effect have you seen with your customers as a result of the Google implementation? A: Customers usually come to visit the store but can also log in and update their subscriptions on their own. There's a quicker checkout process since they do the rest of their browsing online. We have a book club where we collect email addresses for customers that buy certain novels online. Customers are also able to offer reviews or books we sell. These reviews are available both online and in the store. We keep track of this type of data in a CRM and based on it, can help recommend favorites and offer Netflix type suggestions. We're excited to kick off the Google Narratives Series and plan to highlight more developers in our community so if you have a story like Dan's that you'd like to share with us, we're accepting submissions via our online submission form. Better yet, come tell us your story at Google I/O! "...The documentation is well-written with one exception. It would be nice to have a cookbook section - that type is more helpful. More real-life examples in more detail, casual, reader friendly and a commonly used code section. They tend to have lots of detail and the high level can sometimes be fuzzy..."